Perfect. I know good barbecue, but perhaps not the way a Southerner knows good barbecue. 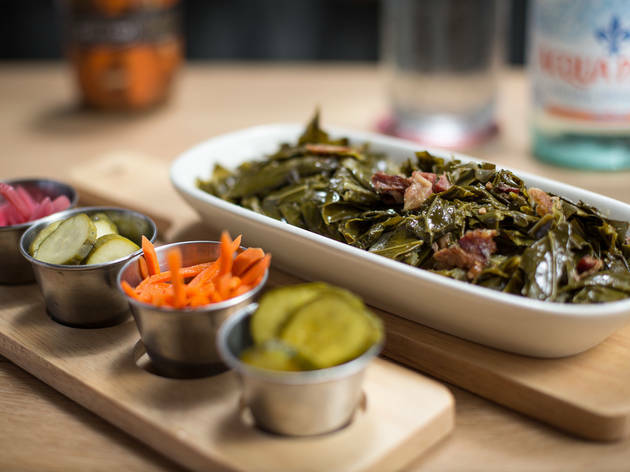 I know that brisket makes me happy when it melts in my mouth, and that I like collards with a kick, and that your fingers should be a mess of sauce at the end of your meal or it doesn't count. But it doesn't matter to me whether it’s called fried cornbread (as it is at Holy Cow) or hush puppies, as long as it's good—and judging by the steady crowd that this place is drawing, it may not matter to most Angelenos, either. 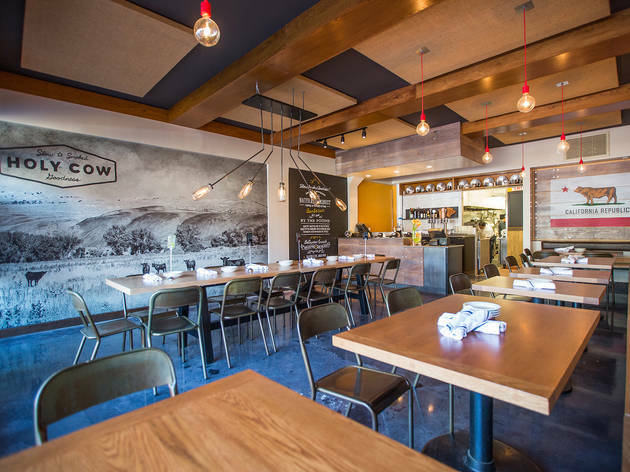 Holy Cow, which took over an old Louise’s Trattoria across the street from the Brentwood Country Mart, is handling its popularity well. A line had formed out the door at 6pm on a recent Sunday night, and the staff behind the counter was a well-oiled machine, packing up pick-up orders and handling insistent diners asking when their seats would be ready. “We’re holding the line until there’s enough room to sit,” they said, giving us more time to debate our order. 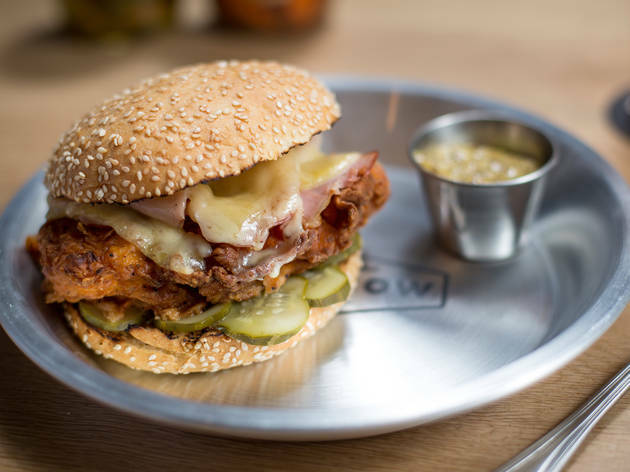 There’s a hefty selection to choose from—meat and sides, greens and desserts, combos, and a section called “between bread,” which solely features sandwiches. With mason jars full of perfectly tart lemonade at the ready (is there a better way to wash down ‘cue, aside from sweet tea? 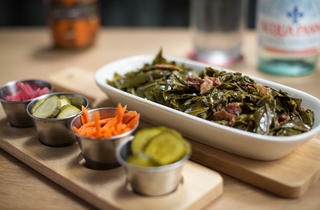 ), we dug into small bowls of collards, mac and cheese and slaw. It was a promising start to the meal—the collards use a healthy dose of vinegar, giving it a smart bite while ham hocks and pork belly add a nice fatty layer to the braised greens. A mac and cheese with four different cheeses—Vermont white and yellow cheddar, Gruyère, béchamel and munster—could have proven a little too cheesy, but the types all complement each other well, resulting in a dish that is rich without being too heavy. The green and red cabbage slaw is not doused in mayonnaise, but dressed instead with a light aioli, celery seeds and roasted garlic. It could have used a little more seasoning, sure, but I was thankful that it didn’t fill us up before we dug into the meat. Because, hot damn, that meat. Holy Cow doesn’t claim a barbecue style, just a dedication to “authentic, slow smoked goodness,” and the baby backs fit that mission statement to a T. Hand rubbed and boasting a beautifully caramelized crust, the meat pulls off the bone with ease, and doesn’t even need the side of tomato-based sauce that sits beside it. 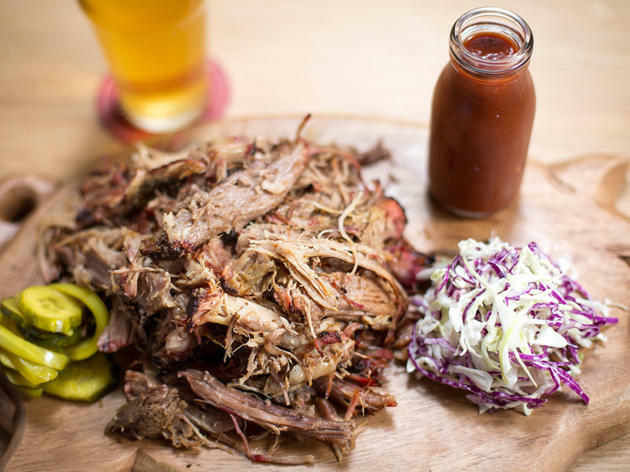 The pulled pork is served up Carolina-style—more specifically, the South Carolina Midlands, where the use of Carolina gold sauce is the standard. Here, the honey mustard sauce is necessary, but only because it pairs so well with the pork. A forkful of meat, a pucker-inducing slice of pickle and that sauce is enough to warrant a repeat visit. The only major downer of the meal? 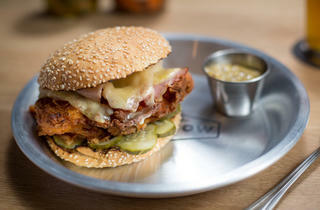 A fried chicken sandwich that was far too dry (both the chicken and the brioche bun that held it). 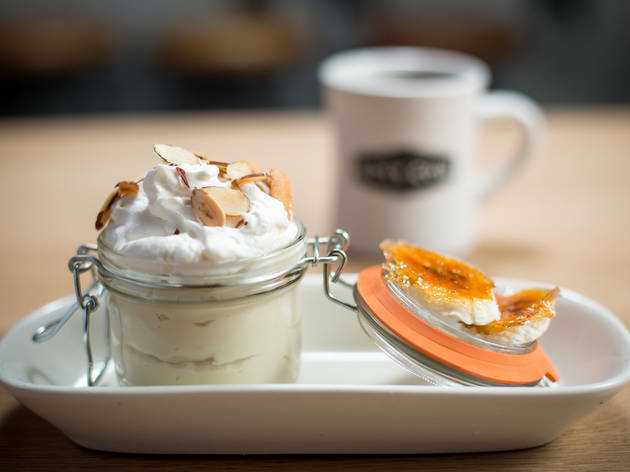 For dessert, there is the obvious choice of banana cream pudding, but a better pick is the peach crumb, a piping hot ramekin filled with baked sweet peaches and a brown sugar and oat crumb topping. “It’s like fall in my mouth,” said the Southerner as we shoveled in spoonfuls. 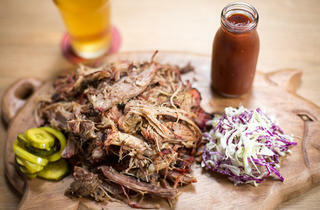 And you should always trust a Southerner when it comes to ‘cue. 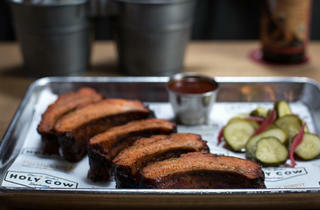 What to Eat: The baby backs (half $13, full $24). The Carolina pulled pork ($14). The mac and cheese ($7). The collards ($5). 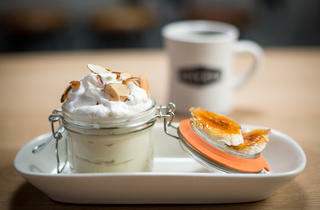 The peach crumb ($7). What to Drink: The beer and wine list is small but well crafted, with local brews like Populist IPA from Eagle Rock Brewery and Little Bo Pils from Smog City Brewing. All of the wines are from California, and for a casual, post-work hangout, a glass or two out on the patio would make for an enjoyable night. But if you're staying for a full meal, get the lemonade. The refreshingly tart drink is just fresh lemons, water and sugar—none of that fake stuff—plus you get free refills throughout your meal. Where to Sit: If you want a seat, you'll get one—the counter will hold the line until more seats become available—but if you're lucky enough to take your pick, opt for the patio or one of the booths that line the far wall. The communal table is just too close to the line that forms to order, and you might have to fend off people hovering over your shoulder asking, "What did you order? Should I get that?" 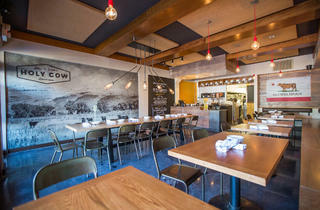 Conversation Piece: Holy Cow comes from Rob Serritella, the man behind MessHall. 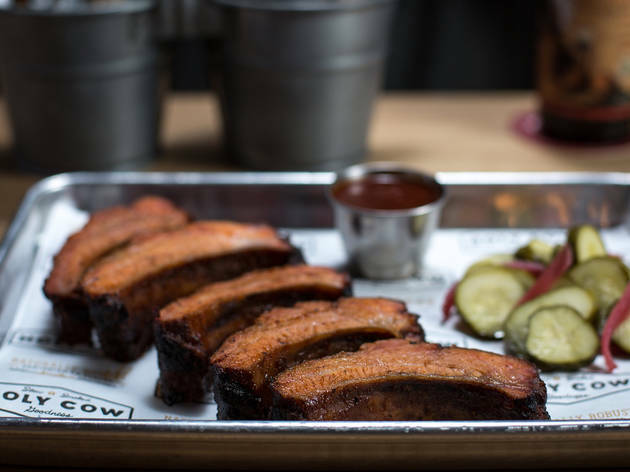 His love for barbecue started when he was a teen, and has led him to travel across the U.S. on a mission to try as many styles of 'cue as possible. Great spot for BBQ, love the lunch special if you are looking for a deal. All of the food is delicious, be sure to get a few extra sides to share with the table. Parking can be a bit hard in this area, but there are free street parking spots if you don't mind to walk a couple blocks. Excellent review, Erin! You made me feel as if I was right there at the table with you as you enjoyed that fantastic BBQ feast. Really looked forward to trying this place and hopefully find some good BBQ in this city so I was HUGELY dissappointed at how bad the food was especially the dry pulled pork sandwich that was barely edible. Yes, I'm a BBQ snob having spent a lot of time in the Carolinas, but even by Los Angeles' low standards for BBQ, Holy Cow is awful..for Christ's sake, the ribs didn't even have any smokey flavor and left me wondering whether or not the ribs were even slow cooked in a smoker.